YTD Video Downloader is a helpful video downloader program that allows you to download videos from YouTube Facebook, Google Video, Yahoo Video, and many other video sharing sites, and it makes the downloading process very easy. However, many users still come up with problems when they are using this YouTube video downloader program. You might get a failed error message while downloading video with YTD Video Downloader, or you may get downloaded videos with no sound. Fortunately, there are quite a few great YTD Video Downloader alternatives out there. You can either choose a downloader to download the video, and then play the video on the player you are used to, or you can choose a multi-functional player that includes the downloading feature. VLC is a portable, open-source, cross-platform, free media player. It can support a wide range of formats, provides good hotkey support, and is easy to use, flexible and lightweight. You can hardly find a video codec or format that VLC can’t handle. It is very easy to use for watching YouTube videos online. You can directly play a YouTube video stream on this player by copying and pasting the YouTube URL into its Network URL box and simply click “Play”. 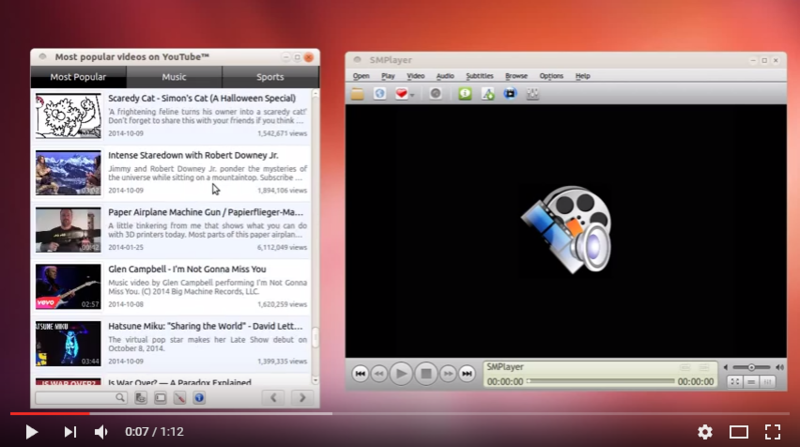 This YouTube video player online also allows you to convert and save the video locally or even stream to other devices. Its capability of reading broken or incomplete video files will benefit users a lot. However, it does take quite a few steps to get a video downloaded. You may want to watch a tutorial first. Whatever YouTube video format it is, this YouTube video player & downloader can get them free downloaded in batch, and playback HDR 3D 4K VR 360 videos locally in FLV/MKV/AVI/MP4/WebM etc. It can convert YouTube videos into mobile compatible formats to allow users watching those videos with Google cardboard. It can playback YouTube videos and movies up to 4K/8K FUHD, stream YouTube 4K/8K HD 1080p videos to big HD 8K TV, and support playback of VP8/VP9/H264/H265 online streaming codecs. SMPlayer is a free media player for Windows and Linux with built-in codecs that can play virtually all video and audio formats. It doesn’t need any external codecs. Just install SMPlayer and you’ll be able to play all formats without the hassle to find and install codec packs. SMPlayer offers YouTube support that lets you play videos right away from YouTube. Open the “Download” tab, to import YouTube videos, enter the target video URL in address bar. Then the internal browser will load source online video. Choose a video to play and enjoy the faster video data streaming and playback powered by our unique video acceleration technology. The YouTube Video Downloader will detect the video automatically and list them on the right. Click the download button to download online video you like. You can choose different resolution according to your own need. Leawo YouTube Downloader acts far more than a single online video downloader to download YouTube videos and other online videos from various video sharing sites like Facebook, Dailymotion, AOL, iFilm, Myspace, Dailymotion, etc. Besides the ability to download online flash videos, this FLV downloader could also acts as video download accelerator to speed up online video downloading, video accelerator to speed up video buffering for smooth playback, video player to play back videos, and IE browser to browse online videos for free downloading. It could extract audios out of online videos, like converting YouTube video to MP3. With Leawo YouTube Downloader, watching online videos offline anytime anywhere is just a piece of cake. Now, if you are looking for a good media player, we’d recommend Leawo Blu-ray Player for Windows, which is a free, all-inclusive media player to play back Blu-ray/DVD disc, common videos, up to 1080P HD videos and audios in almost all formats with lossless quality smoothly on Windows 10/8.1/8/7/Vista/XP. Specifically, it can play back common videos in .AVI, .H264, .MPEG, .WMV, .M4V, .MP4, .OGV, .FLV, .RMVB, .MOV, .XVID, .3GP, etc. and up to 1080P HD videos in HD MP4, HD AVI, HD MOV, HD TS, HD TRP, HD VOB, HD MPG, HD WMV, HD ASF, etc. It doesn’t have a downloading feature yet, but is considering adding it in the future.